Are you ready to exponentially grow your business on Instagram and make lifelong friends in the process? Of course you are! That’s where I come in! InstantBosses launched in 2015 as a community for boutique owners and bloggers to come together to collaborate. The group quickly grew to over 7,000 members! The community now includes entrepreneurs, coaches, website developers, virtual assistants, and more! You name a job that can benefit from Instagram and they’re a part of InstantBosses! Every group reaches a time when they outgrow their medium, and I have had the idea of a more organized platform outside of the facebook group for a long time now. After running multiple Instagram pages it has become apparent to me that this club is needed. You need this support. Running Instagram pages can be difficult and time consuming. The InstantBoss Club will help you cut down some of your valuable time spent on Instagram, giving you more time to relax – in whatever way gives you the most joy! Whether it is spending more time with family and your furbabies or relaxing on a beach somewhere with an ice tea in hand. If you are into binge-watching your favorite Netflix shows, we will make sure you have time for that! This club will give you the time you have been craving. Here is a picture of my furbaby Bentley relaxing with me. It does not get any better than this! We all know that it takes time to grow your Instagram following. Buying likes and followers does not give you true engagement. I have mastered what it takes to grow on Instagram, and make money doing it! That’s why the InstantBoss Club provides you with pre-made graphics to post on your page for filler content. When you don’t feel like putting something together, just pop into the Instaboss Club and download a graphic. Your engagement will skyrocket with posts that go beyond your products! Organization is a huge key to Instagram success! I have created printables to keep you organized with more than just Instagram, but also your core business. These printables include everything from goal sheets to tax organizers and more. Have you ever done a loop giveaway? Loop giveaways are super important in gaining followers and sales on Instagram. I created a calendar that will show you upcoming loop giveaways for you to join. This calendar only includes my favorite loop hosts who always have amazing turn outs! This calendar includes all the details about the loop, like buy-ins, host contact info, follower limits and time and date. Organization and pre-made graphics are just part of the puzzle that is Instagram! Each month I teach you a new lesson about Instagram growth. These lessons cover everything from hashtags to making your first five-figure month and everything in between. Each lesson includes printable worksheets and step-by-step videos. Hands on learning so you can start crushing it on Instagram! One of my favorite parts of the InstantBoss Club is that we have accountability partners! This is someone you can become your biz bestie for life. I know my biz wouldn’t be where it is today without the support of my biz besties. If you do not have one yet, you need one. It is crucial that you have one. We can’t forget the forum! Here you can ask any question your heart desires, or join in on organized follow-for-follow and like-for-like trains. Have a post that needs some love (aka likes and comments)? Drop it in our forum and the InstantBoss Club will come together to support you. This is the kind of support you CANNOT FIND ANYWHERE ELSE. I started my biz about two years ago when I was working for a local bridal shop. I had just graduated college with a marketing and communications degree, but had NO IDEA WHAT I WANTED TO DO WITH MY LIFE. Naturally, I got on Instagram and, BOOM, there it was, like a sign from God. There, I began my journey of growing my Instagram page! It was not instant success, though that would be a great story. It took a LOT of work and a LOT of support from my friends to get there! 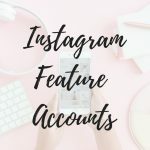 In the midst of trying to grow my Instagram I started the InstantBosses Facebook group because I wanted to communicate with more than 15 women at a time (which is the limit of accounts in one DM). After the InstantBosses group, I was surrounded by so much support there was no way I could fail. Soon my Instagram was up to 10k followers, then 20k, and now over 48k! That is just one of my accounts! I have multiple Instagram accounts now that total reach around 100k followers! Would you be impressed if I told you I continue to bring in 5-6 figure months, solely from Instagram? Cool, now let me teach you how I did it! Come join the club and I promise you won’t be disappointed! !